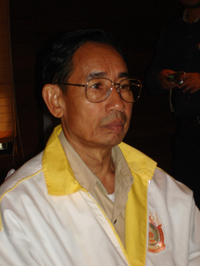 The Karen National Union leader Padoh Mahn Nyein Maung – who was sentenced to life plus three years on March 13th – is released today. Regarding to the release, Naw Zipporah Sein – general secretary of KNU, spoke to Karen News and said. According to a Karen man resident from Insein, Rangoon, Mahn Nyein Maung hasn’t been seen or met with Karen community in Rangoon. Speaking to Karen News, he said. Karen News is in the process of trying to contact directly with Padoh Mahn Nyein Maung. Padoh Mahn Nyein Maung was sentenced under Article 17/1 and 122/1 by the acting judge, U Hla Win to life plus three years on March 13th at a court inside Burma notorious Insein Prison in Northern Insein district.